In the mid-March kitchen garden the winter’s hardy kale, red mustard and arugula are all sending out new growth. 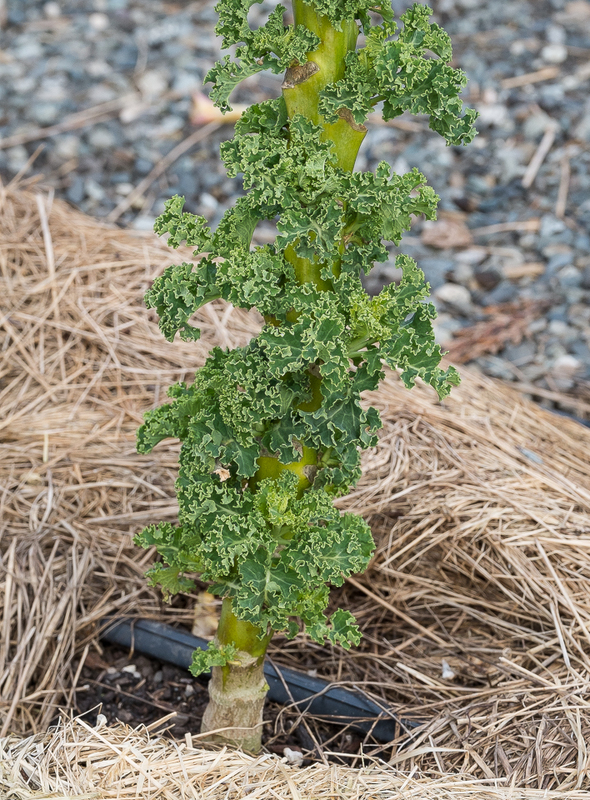 Fresh leaves of kale fan out from scars along thick stalks, clusters of young red mustard leaves rise around each old root base, and new arugula emerges from the tangle of still-tasty old leaves. All of these greens make delicious salads, but last week I discovered that they also add their spring flavors and textures to pasta sauces. The key is to toss them in at the last minute so that they wilt just slightly in the heat of the cooked pasta and other ingredients, taking on a slick of olive oil but staying in the zone between raw and cooked. I started on this pasta-sauce path while looking for something to do with the last stored bag of the Rose Finn Apple fingerlings. 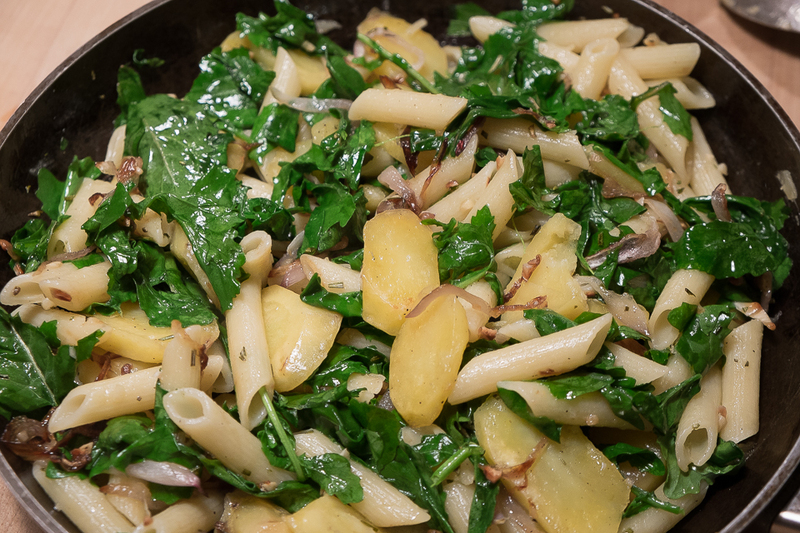 In Alice Water’s Chez Panisse Vegetables (1996) I saw a recipe for Pasta with Potatoes, Rocket, and Rosemary. There was plenty of rosemary and wintered-over arugula, the more familiar name for rocket, in the garden and still potatoes, onions and garlic among the storage vegetables. The combination of these flavors sounded promising and because the arugula was so fresh, I decided to add it at the very end. Since I was serving two instead of four, I more or less halved the original recipe below and kept to these proportions as I experimented the other greens. Preheat the oven to 400°. Slice the potatoes about 1/3 inch thick and toss them with a small amount of the olive oil, salt, and pepper. Spread them in a single layer in an ovenproof dish or on a baking sheet and roast in the oven until they are golden brown and cooked through, about 15 minutes. 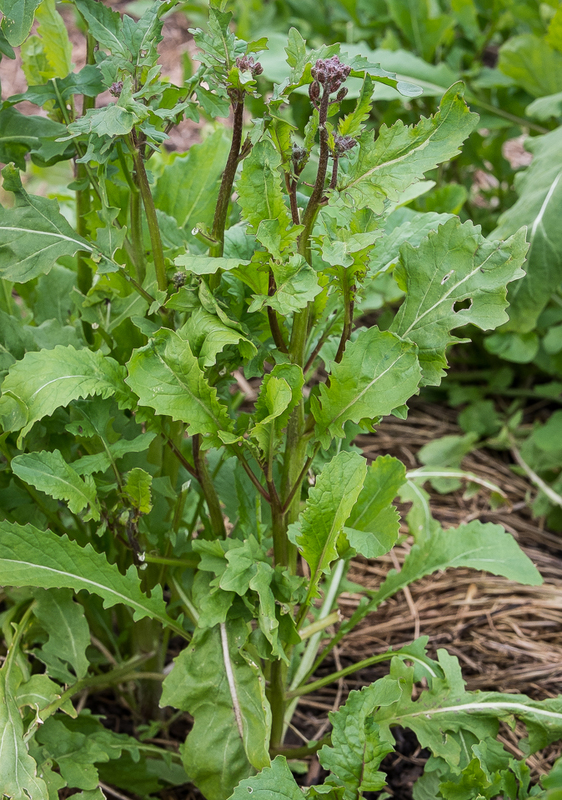 Meanwhile, wash the arugula (older, larger leaves are preferable to the tender sprouts), drain, and set aside. Slice the red onion thin. Peel and chop fine the garlic cloves and the rosemary leaves. Put a large pot of salted water on to boil for the pasta. Inspired by the delicious results with arugula and roasted fingerlings, I used this technique the next night with red mustard and delicata squash. 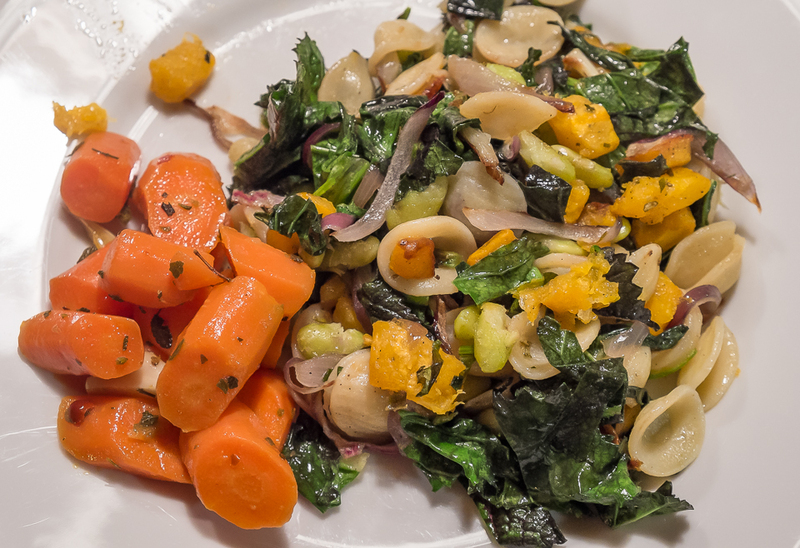 After peeling, dicing and roasting two of my remaining Honeyboat Delicata squash, I tossed them with the softened red onion, rosemary and garlic and a few leftover flagelot beans and added cooked Orecchiette pasta. Then just before serving I added sliced ribbons of red mustard leaves and tossed them briefly as they wilted. The hot, spicy mustard and the soft, sweet squash were a perfect combination with the pasta and beans. A side of pickled carrots completed the plate. Following the mustard/squash success, I turned to new growth kale and white runner beans for the next night. After sautéing a red onion and some garlic, I added about a quarter cup each of slivered dried tomatoes and diced roasted red pepper, then a cup and a half of white runner beans and drained fusilli pasta. 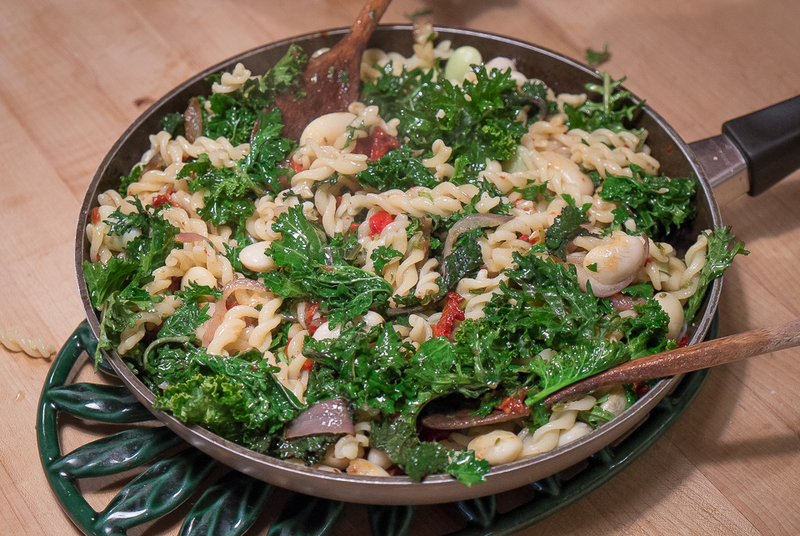 Finally I piled roughly torn kale leaves onto the hot pasta and beans, drizzled them with olive oil, sprinkled on a couple pinches of sea salt then tossed the ingredients together. Once again the greens wilted slightly into the pasta and sauce. 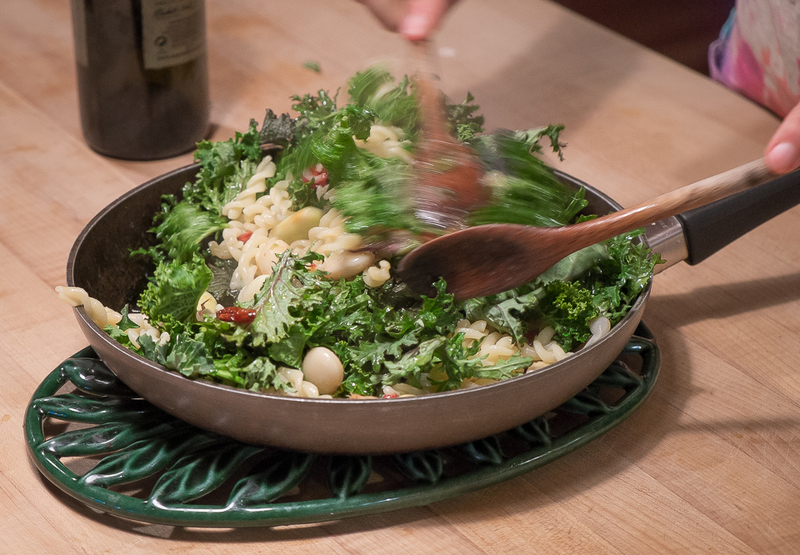 The nutty beans and earthy kale combined with the sweet pepper and more acid dried tomato to make another tasty meal. The winter storage vegetables, the potatoes, squash, beans and onions by themselves would have made fine additions to pasta but the greens, fresh from the late winter garden, transformed these dishes into spring. 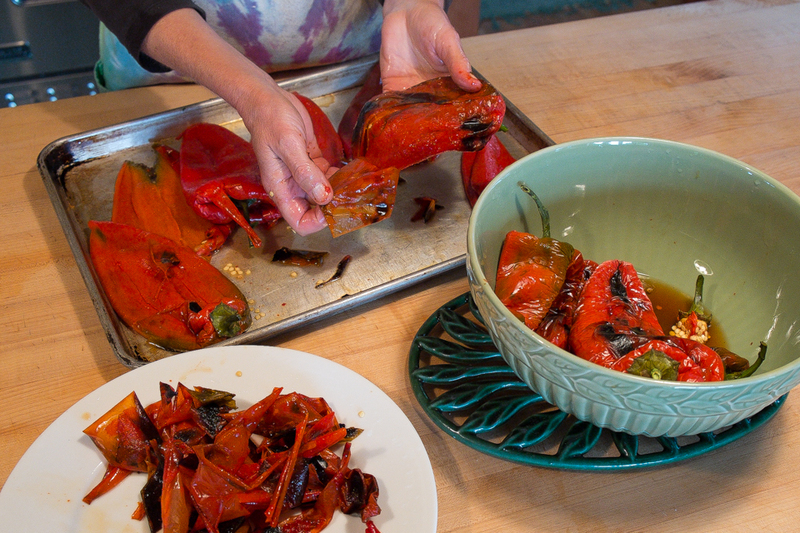 We’ll make them all again soon and maybe make our favorite, the red mustard and squash, even more often as winter gives way to spring. We’ve had a cold frame against the south side of our garden shed for nearly twenty years. Scott built it soon after he built the garden shed. 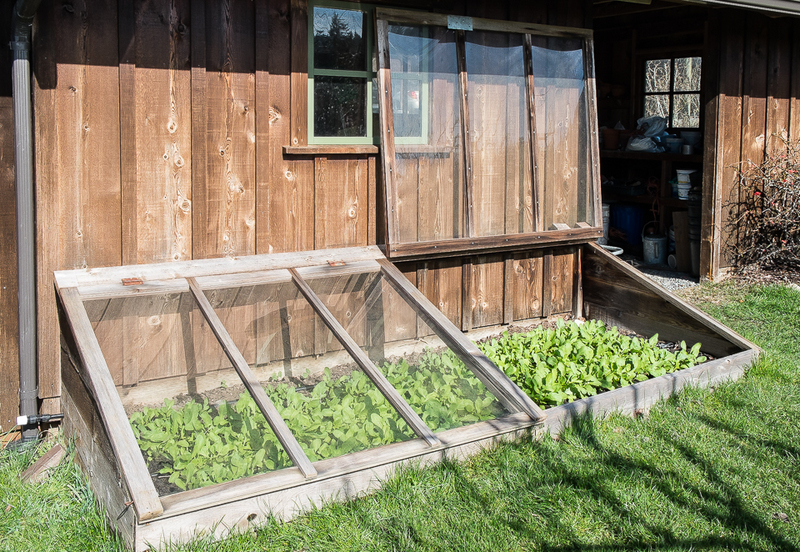 We hadn’t planned on making a cold frame but our observant and generous neighbor Bucky Lee noticed the empty space on the south side of the new shed and offered us two old, three-paneled wood and glass windows he didn’t need, saying that they would make a nice cold frame there. They were just the right size, each 60 inches wide by 50 inches tall, wide enough to fit between the downspout on the west and the doorframe of the shed entry on the east and just the right height to fit up under the eaves when open. Of course, these heavy old windows were just the start of a cold frame. Using their dimensions, Scott attached a ledger to the building 28 inches off the ground, built the sloping sidewalls, the long, low ten-inch-high front wall, added a support in the middle where the windows would meet when down, and finally attached the windows to the ledger with hinges that allow us to raise and lower them and added sturdy eyes to the window frames and hooks to the shed so we can latch them open. Bricks work to prop the windows open when we want to provide just a little ventilation. While Scott did the carpentry, I prepared the soil, removing sod, breaking up dirt, adding compost and raking the area level. When the cold frame was done, it looked like it had always been there especially after we painted the frames green to match the shed windows. The wood frames held up to the weather for the next five years before finally deteriorating to the point that we needed to replace them. Using plexiglass and strips of wood, Scott made new, lighter covers that we’ve used ever since. 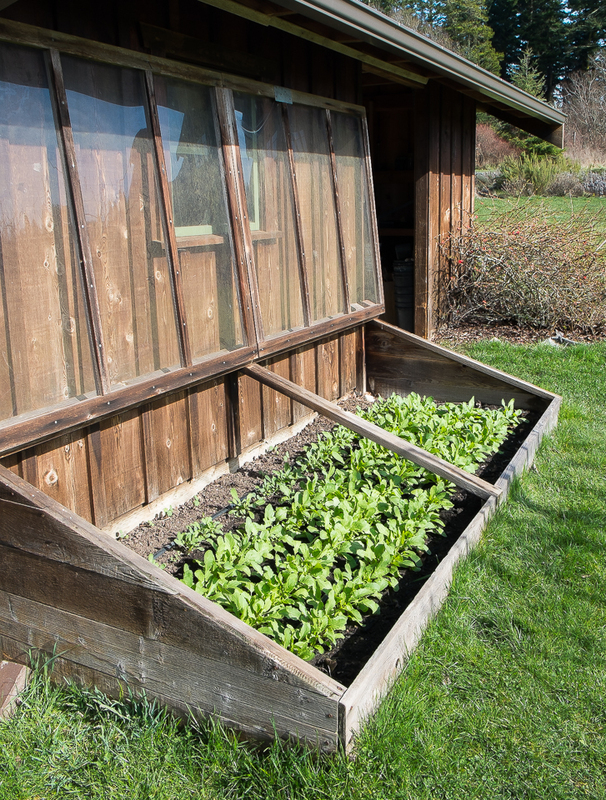 Perhaps because my father had a cold frame near the back door on the south side of our family home in Massachusetts, I’ve always thought of cold frames as old-fashioned structures, their glass tops and wood frames more permanent than today’s plastic covered tunnels and low hoop houses that can be moved from bed to bed as crops and seasons change. 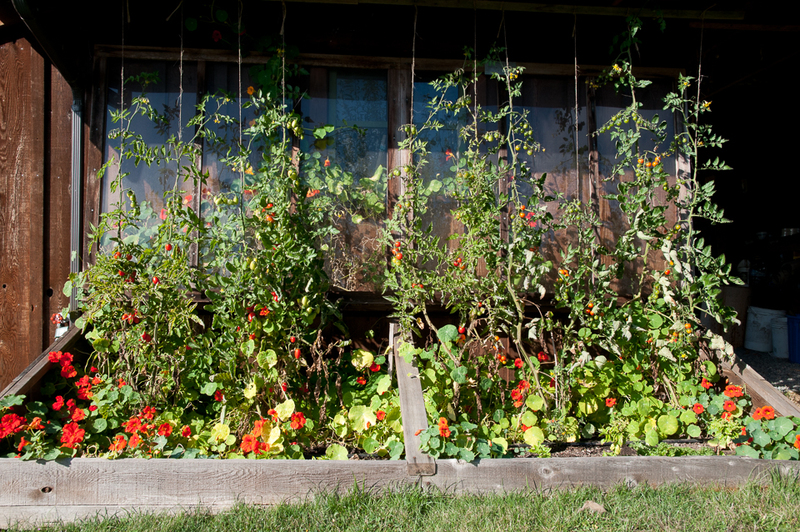 Attached to a building, cold frames cover the same plot of soil year after year. 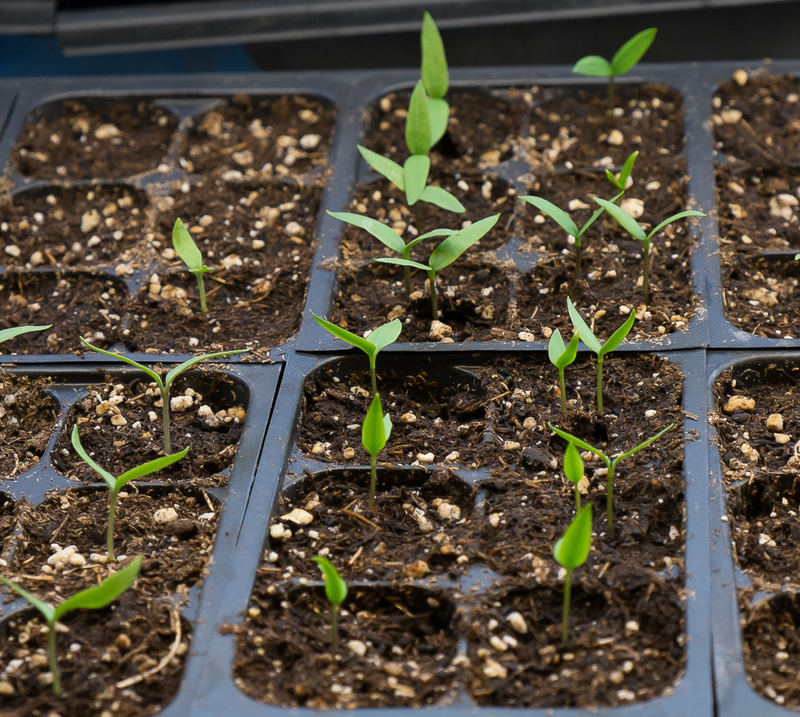 My father used his cold frame only in the early spring to give a head start to plants like broccoli and tomatoes that he’d later transplant to the garden. In the summer, my mother filled it with flowers. 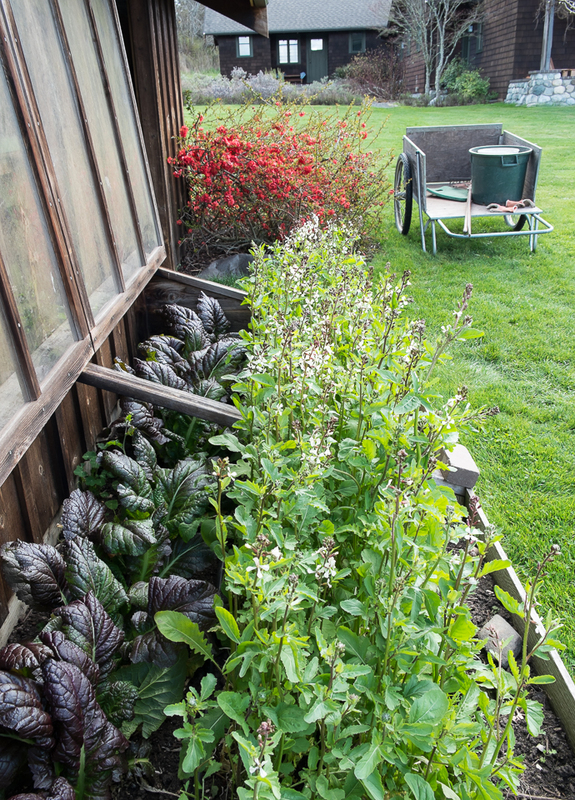 Here in the temperate marine northwest however, I can use the cold frame in all seasons. 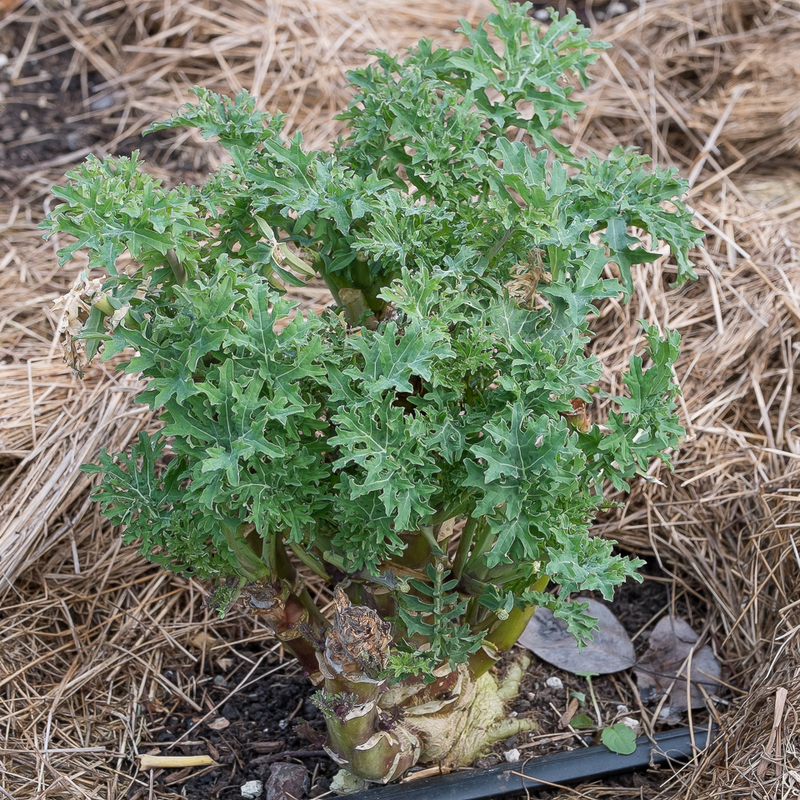 In fall, I plant it with greens, either seeds or starts, and they thrive there over the winter and into early spring. Greens planted in mid-September are ready for December salads. This year’s arugula planted in mid-November has been giving us salads since mid-February. In early spring, if we’ve eaten all the greens or if the greens are going to seed and are ready to pull out, I’ll plant an early crop of lettuces, salad radishes and spring turnips. Or if the greens last into late spring, as this year’s arugula may, I’ll skip a spring planting. In the summer, I’ve sometimes filled the cold frame with basil, leaving the plexiglass open and draping Reemay over the frame to protect the basil from sunburn. Other summers, I’ve planted cucumbers or melons in the cold frame and their vines have sprawled up and over the sides. Even with the cover raised for the summer the south-facing space framed by the garden shed is warmed by the sun, so some years I’ve planted several varieties of indeterminate cherry tomatoes and Scott has tied them up in front of the windows. 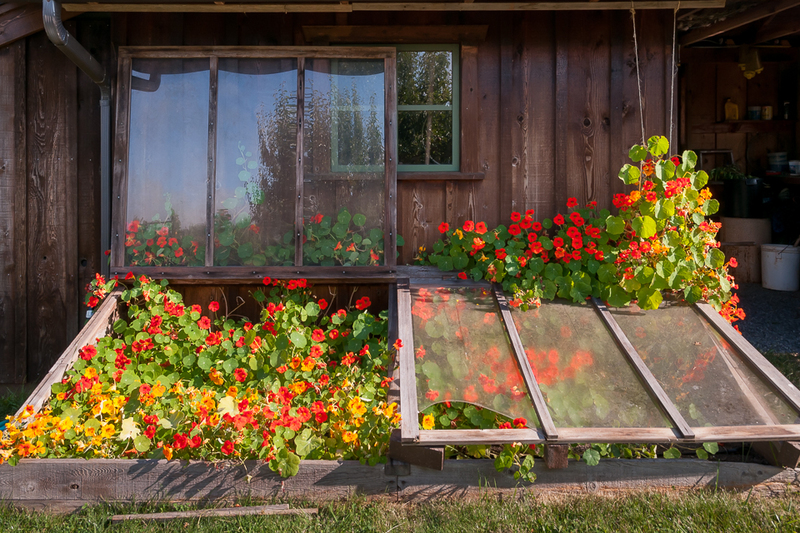 And some summers I’ve simply left the cold frame to a volunteer riot of nasturtiums. By fall, whatever crop has grown there in the summer is ready to pull and I once again plant greens for winter salads. With several portable plastic cloches in the main garden, I’ll admit that I really don’t need a cold frame. Winter salad greens, early spring vegetables and heat-loving summer plants all thrive in these other structures, but our cold frame is so beautiful in all seasons, so much a part of the permanent garden and so sweet a connection to the past that I’ll never give it up.